Madonna has a new project debuting in a few days (September 24), and it is very secretive…kept under wraps…which can be seen as somewhat ironic since it is all about shedding light and freeing up communication and expression. Her Art for Freedom movement (hashtagged as #SecretProjectRevolution) includes a 17-minute film created by her and Steven Klein, super artsy but also edgy and poignant (if the preview clips are any indication)—it’s focus is oppression of art and free speech. We live in a time when we who can, have an obligation to stand up and speak out for freedom. Art for Freedom will be an open-source platform for any and all of us to create artistic representations of our message, call to action, cry in the dark, grasp for connection—and share it as part of the “revolution.” There was a time when Madonna could do no wrong for the mass audience. There was also a time when she could do nothing but wrong in the eyes of many of the same people. This will get the crap criticized out of it, for sure, but Madonna never stops, and at the core she stands strong for true causes that mean everything to her–and all of us. It’s audacious in the wonderful ways that make that one of my favorite words. So explore…and ENGAGE. Madonna, a bigger star than Piers can ever hope to be, is certainly not hurt, or even affected by his hubris. While my fandom for Madonna has never been rabid, my admiration for her is top of the charts. Her commitment to children is much more than a PR pose, and her focus on the nation of Malawi, I believe, truly does make a difference there. Her Raising Malawi charity has helped over a million children orphaned from the AIDS epidemic, and she is spearheading education efforts for girls, poverty relief, orphan issues, and children’s mental health. In addition to general support of the charity, you can also volunteer, at home, or in Malawi, with World Camp, the sanctioned volunteer organization working with Raising Malawi. World Camp volunteers work in rural schools and street shelters, teaching kids about HIV/AIDS prevention, nutrition, gender equality, environmental issues, and human rights. There are general volunteer programs geared for adults, as well as “youth to youth” programs to get teens involved. Just think of all the things you don’t know right now, that you will come home knowing after a volunteer gig with kids in Malawi. One of the things I try to emphasize when speaking to people about choosing a volunteer vacation, is the importance of knowing who assessed the need for the project in the first place. If you are working on community building and helping with social issues, it is hugely important that the community members being served are the ones who decided they need help, and what kind of help they need. Well meaning but misdirected volunteers and organizations can undo some of their good will and best intentions by forcing a foreign perspective onto a culture where it is not a very good fit. Madonna ran into a situation like this quite recently. I am not one to disparage Madonna or any celebrity involved in generous causes around the world–I kind of think they are superstars, not for their fame, but for bringing attention to important issues in ways only their fame allows. They are able to open doors as well as unite fans and followers in ways many of the rest of us cannot. We certainly would if we could. The fact that celebrities are willing to lend their names, their wallets, and quite often their hands-on work, gets more people involved, and that can only be a good thing. IF–the projects and organizations with which they align themselves are in step with the community served. 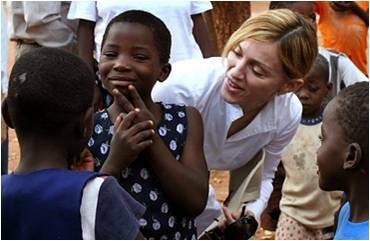 In Malawi, a nation Madonna holds dear to her heart and family, the national government has told a group of villagers that they will lose their homes and be forced to move away to make room for a girl’s school the pop star is having built. Residents, according to an Associated Press story from yesterday, have refused to leave the site just outside of capital city Lilongwe. 200 villagers are being displaced, and I have to wonder if there isn’t perhaps a better, less intrusive location for the new school. The government has offered the residents other government land–and I don’t know the details of why THAT land is not a good site for the school, but it truly underlines the point about being sure the goals of the charities with whom we work are the SAME goals as the people we choose to help. I’m sure they will find a solution that benefits the village children AND keeps the village united…but what a tough first step motivated by love and philanthropy, but perhaps, unknowingly, off target. It is important due diligence research you need to do before signing up for your volunteer work. Who determines the need? And who decides what is a successful outcome of our work? One of the things about working so closely with a local community on a service vacation…exascerbated when living with a local host family…is saying goodbye. That family becomes your family and it is devastating to think you might never again be in touch. The British volunteer vacation company, Projects Abroad (www.projects-abroad.org), (an organization that has hosted both Angelina Jolie and Madonna) is working with Vodaphone to help create a long-term connection between volunteers and recipients of aid projects. The company has found that more than 70% of their volunteers are women, and has marketed the idea as an “adoption” program for young female volunteers, where a child with whom you’ve worked is given a pay-as-you-go cell phone that is funded by Projects Abroad (with at least £5 per month topped off remotely by the volunteer) so you can remain in contact with the family indefinitely. Saying goodbye after creating such a bond will never be easy, but this is a smart idea (that I hope will catch on with other organizations) that can help ease the ache. Ain’t no big thing for a huge celebrity to part with a handbag or twelve…they get a whole lot of them, and other swag, free. BUT, it is a great thing when such simple shedding of excess can go toward the global good. Salvatore Ferragamo is supporting L’Aquila, and the Italian region’s efforts to rebuild after the devastating 6.3 magnitude earthquake that struck in April. Celebs like Madonna, Jennifer Aniston, Eva Longoria, Gwyneth Paltrow, Demi Moore, Hilary Swank, Lily Tomlin, Lucy Liu, Dita Von Teese, and Debi Mazar have donated their own Ferragamo bags to an online charity auction via eBay. 100% of the proceeds will go to GlobalGiving‘s Italy Earthquake Recovery and Relief Fund.